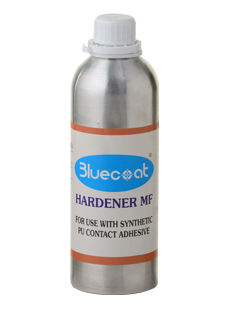 Bluecoat Hardener MF is used as crosslinking agent for synthetic polyurethane contact adhesive. Recommended dosage 5-7% for 2 component polyurethane adhesive. Keep container tightly closed when not in use. Keep away from sunlight. Available in 1 kg bottle.